« Damn it Dems. Make news on what repealing ObamaCare means! 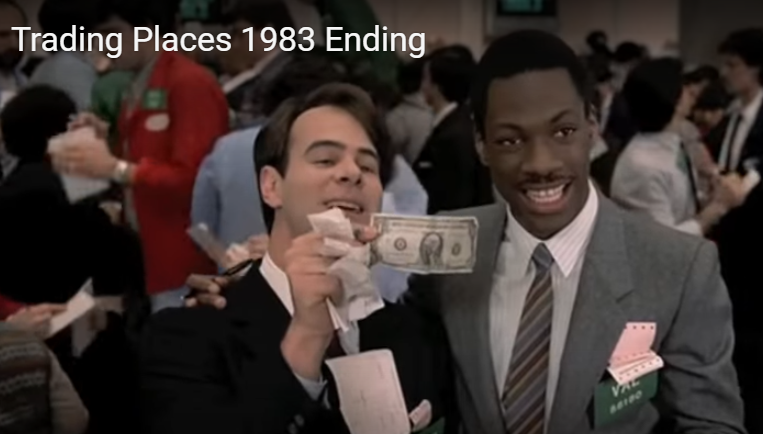 There is a great scene in Trading Places where the good guys win, and the bad guys are defeated. This shows the results of fighting back. This is my idea of a perfect resolution to fighting leaders and funders of the right. I know it’s a fantasy, but there are real lessons to be learned from it. You want to fight the right? This is how we fight. What makes this clip satisfying are four parts. 1) A comeuppance that REALLY hurts them. The Dukes lost status in the eyes of their peers, they lost all their monetary assets as well as their symbolic asset–their families’ inherited seat at the stock exchange. One brother loses his health with a heart attack. 2) The brothers turn on each other. Instead of figuring out how to game the system or keep their money, they attack each other. The Dukes could have had healing power of forgiveness and love of family, but that was also destroyed. 3) The rules set up by the Dukes were used against them. The Dukes created the rules to use against others and didn’t expect the rule to apply to themselves. 4) The people who defeated them profited. It was great to take down the Dukes AND profit. Just defeating them would be great, but what a sweet deal it was to profit from the Dukes destruction. The question now is, will Valentine and Lewis become just like the Dukes? Hopefully not, because they have learned a lesson. A lot of people talk about fighting back “The Chicago Way.” What people forget about that method is that when you go after someone powerful like Capone, he and his organization won’t sit back and let it happen. But if you believe in what you are doing you have to keep thinking, fighting and organizing. Speaking of organizing, I’m tired of the “herding cats” metaphor, so I’ll bust it. You want a herd of cats? Bring 9 flavors of cat food to the location with multiple can opener sounds. Want them to go nuts? Catnip appetizers. There are very clever people out there organizing. The question now is, what do you do with that herd of cats? If your first fight plan doesn’t work, for example the bad guys can’t get legitimately busted in an area they control, find an area they don’t, just like the Feds did with Capone on taxes. But you also need to know that they won’t just roll over with one punch. it’s yet another way to try and bend the system to their will. We are looking at failures after losing, but what about our failures after winning? It’s great when you’ve won. It should also bring up questions: Who did you fight for? Was it worth it to stop the bad guy? Or will someone else worse take his place? And importantly, how do you build on a win? In this case part of the win is to let the other lesser Capone-types know they aren’t safe. Then it’s changing laws to make it harder to game the system. Part of winning is acknowledging the corrupting power of money, and setting up systems to monitor it that aren’t easily captured. This is all part of the fight. It’s not as exciting as epic battles, but it is crucial for future success. I was hoping to get an invitation to a meeting with a bunch of power brokers explaining “The Spocko Way” but apparently my email invitation got intercepted by Russian hackers. I was going to tell them there are lots of good fights and fighters out there. Great battles are coming. We will win some. We will also lose some. Activists who are taking on powerful interests need powerful friends during the losses and the wins. I’m encouraged and excited by reading about re-energized activist groups and new ones. We need lots people to understand the system we are in now vs. previous systems. We need to learn how to fight to make an impact. And we need to be reminded of the importance of persistence. We can never stop fighting until the fight is done.